This Fig and Fennel Rocket Salad is simple but delicious. This salad is inspired by one of my new favourite breakfast, brunch and lunch place in town, Bakers and Roasters. It’s a cosy place in district de Pijp which serves wholesome breakfasts, excellent coffee, delicious salads, home-made pies and beautiful juices. Last time we went there they served a simple fig salad. I love simple food; it’s the ingredients that matter. And if you use beautiful fresh produce and high-quality ingredients, you can’t go wrong. 1. In a small bowl mix the extra virgin olive oil, vinegar and honey together. Season to taste with pepper and salt. 2. Add the thinly sliced fennel to the dressing and allow to ‘pickle’ for at least 30 minutes. 3. Add rocket to a large salad bowl. Remove fennel from the dressing and add to the rocket. Gently mix in the quartered figs. 4. 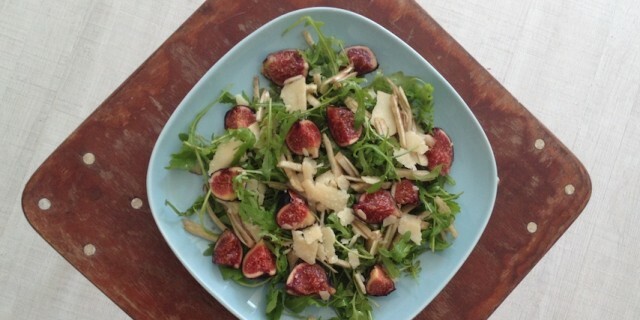 Sprinkle the dressing over the salad and serve this Fig and Fennel Rocket Salad with shaved Parmesan cheese.